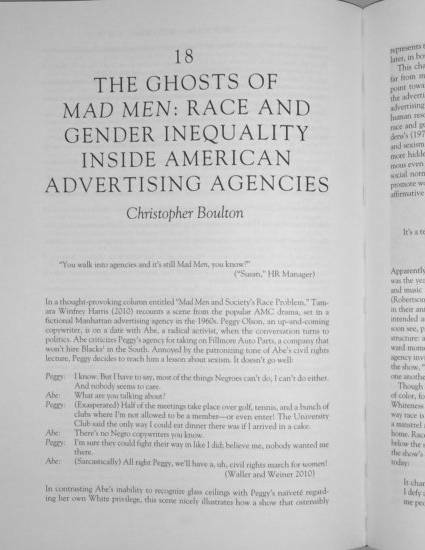 This chapter juxtaposes interviews of advertising practitioners with scenes from the AMC drama Mad Men to suggest that the show, set in the 1960’s, helps explain how the twin specters of sexism and racism continue to haunt the industry today. While contemporary forms of discrimination may seem less explicit when compared to Mad Men, tacit rules still allow hiring on the basis "fit," familiarity, and even friendship. Thus, despite various efforts to increase racial diversity and promote women within advertising, a structural system of referral hires and socially segregated networks continue to advantage White men, especially in upper-management and creative.